As you can see, there are a number of places where the stones don’t fit together tightly. The glue that I used to fasten the stones in place is the right color for mortar, so I will likely fill some of the larger gaps with the glue “mortar” to neaten things up. I had to pull each one of the stones off the mesh backing, then clean off the bits of glue and mesh from the stones before I could install them. It’s a bit time consuming, to say the least! And for partial stones, I had to score and break them with a tile cutter, or nip them with the tile nipper to make them the correct size. As you can imagine, a few stones got ruined in the process. And of course the stones aren’t all uniform in size so the lines aren’t as straight as I would really like for them to be. I did minimize this by adding glue in strategic spots but there’s still a bit of an issue. The scotch tape and paper clip box are pushed partly inside the firebox, supporting the run of stones that go across the top of the firebox. They are sitting on the hearth shelf. Which I can only make out of wood because there will not be a real fire in the fireplace, LOL! 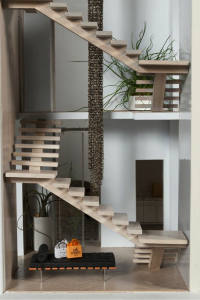 Ahh the joys of dollhouses – no building codes, and you can leave out what you don’t want to deal with or have no interest in. For instance, I have an opening at the top of the stairs to what will be the roof deck. Because I don’t have to worry about it raining into the house, I don’t have to make a stairwell room on the roof – it can just open right up there. Lovely! And, I don’t have to have a closet in my master bedroom. After all, the dolls’s clothes are permanent, so they don’t need a closet to keep anything in. And nothing has to be stored because if it isn’t out in the house, it isn’t needed! And no plumbing needed either. What a relief. It’s been close to a year since I started this project, and it will be at least another year or two before it is finished. I am unable to put a lot of time into it, but that isn’t a real problem for me. I am enjoying the process. Getting it done will be good, but I am not impatient to get there. I really love building things so taking my time on this is fine with me. I may redo things as I move along. I don’t have much problem thinking of that, as I can take the time I want to take to fix anything important to me, or I can ignore what is not so important. And sometimes ideas take time to percolate through my brain and fully form themselves. So I’ve thought of a few better ways to do things already. Maybe I will redo them. Or maybe I won’t! I think I may fill some of the cracks between the stones with grout, which will not show too much. I can use my baking supplies – plastic pastry bag and icing tips to do this. What fun! 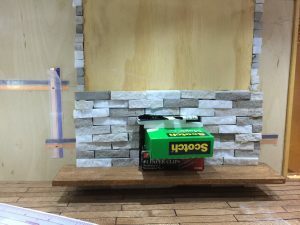 I’ve finished reinstalling the greatroom ceiling, cut the fireplace base piece and have started installing the stacked stone on the side of the fireplace base. To do this I am peeling the stacked stone off the mesh backing, cutting the stones as needed with a tile scoring/breaking tool and tile nippers, and gluing them in place with a construction glue that some guys at Home Depot clued me into. Since this is not a full size stacked stone installation, I don’t need to use mortar – glue is fine. Here’s a picture of the fireplace in progress – at this point the stones along the sides of the wood base are the only ones in place. 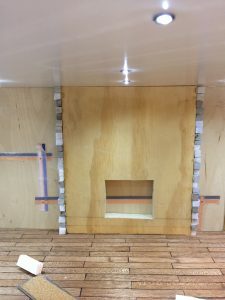 Next step is to install the front base row of tiles and then install the wood hearth, which will be cantilevered at the front of the fireplace base. If you enlarge the picture, you can see the pencil lines where the wood hearth will be affixed. 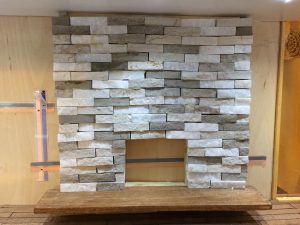 I thought about using slate, because I can purchase slate tiles, but since no actual fires will be burning in the fireplace I can use wood, which is easier to work with. I don’t have a wet saw so I’d like to avoid major tile cutting situations. These stones won’t actually show from the front view of the room as they will be covered by the face stones. The electrical tape runs behind the fireplace so that the electric fire can be installed. The interior of the fireplace will be lined with paper that looks like stone or cement, not sure which yet. I may cantilever the mantel as well, but may just glue it on to the stones. I’ll decide when I get there! But I had two more days off after we returned so I was able to finish the foyer two story chandelier! It looks great! It is not identical to the inspiration chandelier. That one was made entirely of chains. Mine is a mix of chains along with strings of crystal beads alternating with silver beads, and it is illuminated with dollhouse Christmas lights. As you can see, it is all made of chain. 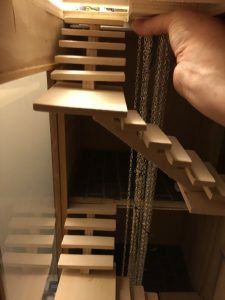 Yes, the stairs still need to be painted (stringers) and stained (treads), but I will just wrap the chandelier up in a plastic bag when I do this. The false ceiling with the pot lights is now installed under the roof level of the foyer. Once the floors and ceilings are all in, I will add wood tape to cover the raw edges of the floors/ceilings. It’s moving along pretty well. I will say that stringing all the beads and otherwise making the chandelier was very time consuming, and expensive. I could have saved a lot of money using clear plastic beads instead of the crystal, but I tried that and it just did not have the sparkle I wanted. Bling, please! Amazon helped me with the prices, thankfully. I found some reasonably good deals for the crystal and mixed them with round silver beads to help with the sparkle while reducing the overall cost. I have some housekeeping things to do, which I’ll probably do next, including reworking how I have installed the drop ceilings. Then I’ll start on the stacked stone fireplace, followed by the kitchen cabinetry, appliances and countertops. After that, probably the shower in the bathroom, and the floating vanity, both of which I will be making myself. But I wanted to add some sparkle to it, as well as lights. So in addition to the chain, which is more silvery and less gray, I wanted to add glass or crystal beads. I had to order those online, so I used some plastic beads and fastened in only one strand so I could get an idea of what it looked like. 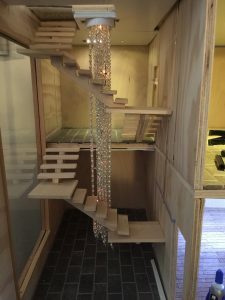 Later this week I will be installing the crystal bead ropes and then will try it out. There is some potential I may need to add more chains. We’ll see. I used the white plastic lid from a cream jar. I drew dots on it using black sharpie where I wanted holes drilled for connection of the chains. I then drilled the holes using a drill bit which is very tiny, but not the smallest one I have. The holes looked just perfect. I had purchased some eye pins, which are in the beading department of Michael’s or Hobby Lobby and which look like straight pins without sharp ends and which have a metal ring where the head of a pin would be. The reason I needed them is that I needed something to fasten the chain to which did not show on the “business” side of the chandelier. So I pushed them through the holes I drilled, on the “wrong” side of the cream jar cap, and then bent them up with my jeweler’s pliers, into a loop over which I hooked one end of the chain. For the bead string, I strung the beads on beading flex string, using a crimp bead at the bottom to hold the beads on the string. At the top end I threaded on a crimp bead and then bent the thread around and back through the crimp bead, making a loop. I then crimped the bead to hold my loop in place. I then connected the loop to the eye pin as I did with the chain. All done! At least, until I receive the shipment of crystal beads. 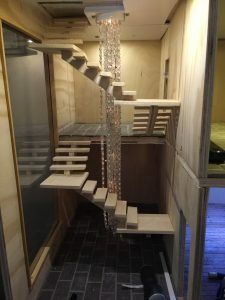 Once this is done I can install the false ceiling, connect the chandelier to the electrical, and that will finish the main electrical work. The next project will be installing the tile flooring in the second floor foyer partial floor and the bathroom. I have to cut the tile, which will be another learning experience with the Dremel. Hopefully that will go well. I felt like shopping earlier this week, and I bought some adorable fabrics to use on my sofa, which I plan to make myself. Some of the fabric can also be used for throw pillows. I’m definitely having fun! This might be the only house I get to design and build, ever! We’ll see, though. I’d like to make some more, but I have to figure out what to do with them as I can’t keep many, living in such a small space.